This post is in partnership with Grove Collaborative, which I’ve loved whole-heartedly for the last year. My only complaint is that they don’t come wipe down my counters for me. I burst out laughing because he’s so right. I’ve mentioned it before probably, but Bart is definitely a cleaner and I’m definitely a clearer. He’s the one who cleans the bathroom mirrors off when they start getting grimy and makes sure the kitchen table is wiped down after a meal, but he’ll happily keep a stack of papers on his desk for months on end and he’s not bothered by a pile of cords on his bedside table or a heap of things on the kitchen counter. Whereas I clearly don’t notice (completely-totally-invisible-who-would-even-notice) crumbs on the counter, but a couple of toys left on the fireplace make me bananas. On Saturday mornings, we usually spend 30-45 minutes cleaning up the house as a family, and while Bart cleans the bathrooms, the girls and I do a Stuff Blitz. We go to every main room in the house (kitchen, living room, dining room, my office, the entryway) and gather up absolutely everything that doesn’t belong. The girls love this part. Then we dump all this stuff on the kitchen table and set a timer for about 10 minutes and then all of us work as fast as we can to put everything on the table where it actually belongs. 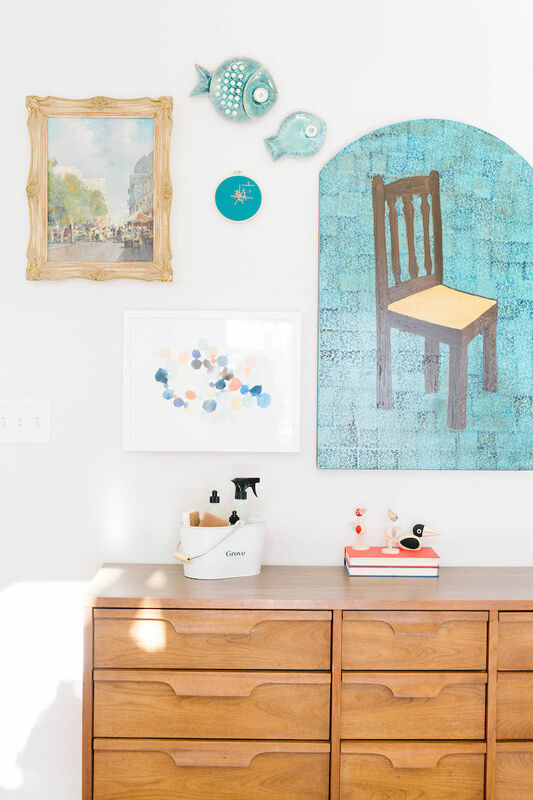 The girls aren’t AS wild about this part, but the race against the clock is fun and it is so liberating for me to have no odds and ends sitting on my kitchen counter, my desk, the coffee table, by the front door or on the edge of the bookshelf. 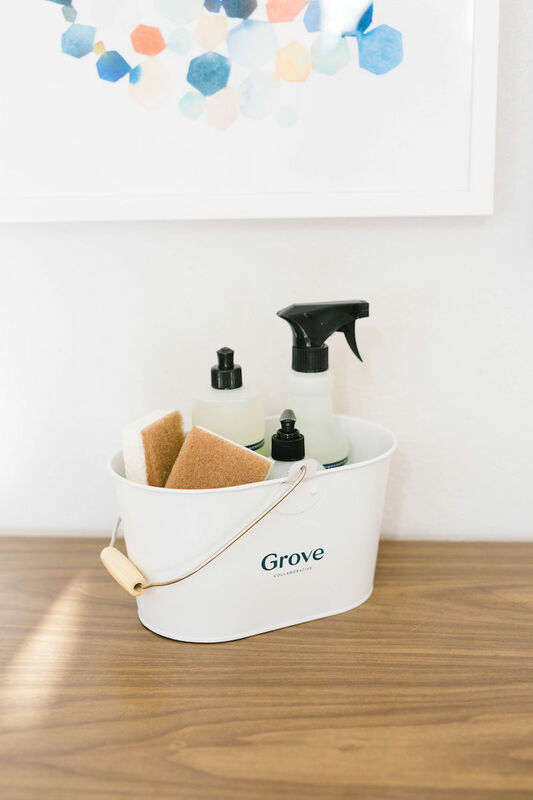 And if you’re more of a cleaner than a clearer (or if you’re like me, a clearer that would LIKE to be more of a cleaner), consider checking out Grove Collaborative. Whether you’re looking for cleaning products that are better for your family or sunscreen or personal care items, they pretty much sell it all. 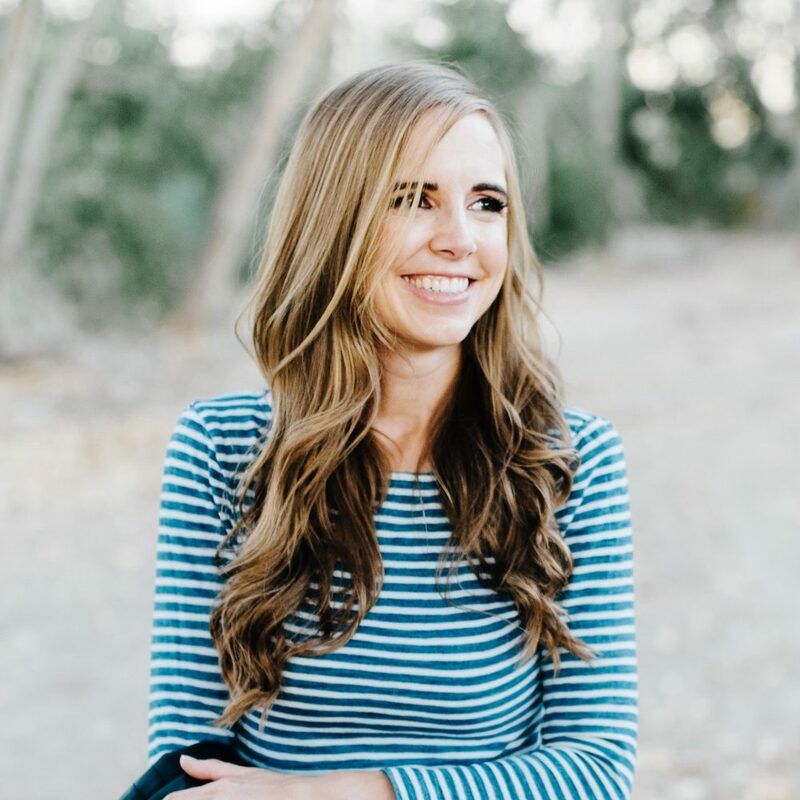 Some of the products are from well-known brands like Mrs. Meyers’ or Method and they also sell their own line of products, which I’ve been super impressed by since I started using them a year ago. 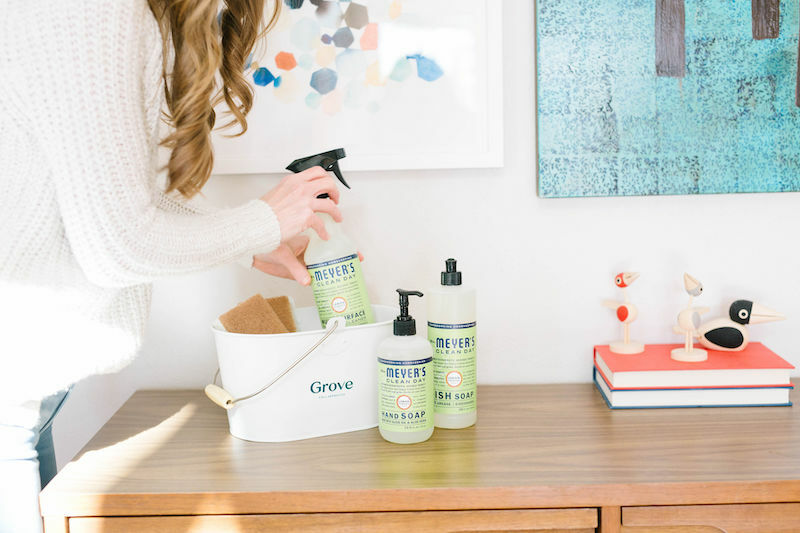 And if you’re a new customer, they’ll send you the whole set of Mrs. Meyer’s products (hand soap, dish soap, and multi-surface spray) for free when you place your first order of $20. I just am finishing up my set of Mrs. Meyer’s fall scents (by the way, some people told me they couldn’t stand the pumpkin scents, but I absolutely loved them) so I ordered a new set of hand soap, dish soap, and multi-surface spray in Lemon Verbena. And they have a bunch of other scents you can choose from too. 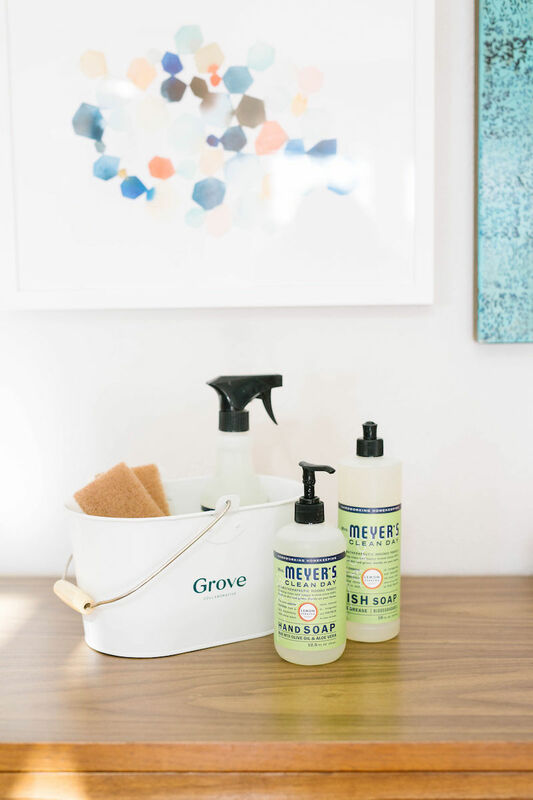 AND, they’ll throw in a free cleaning caddy and a set of Grove walnut scrubbers, plus free shipping. 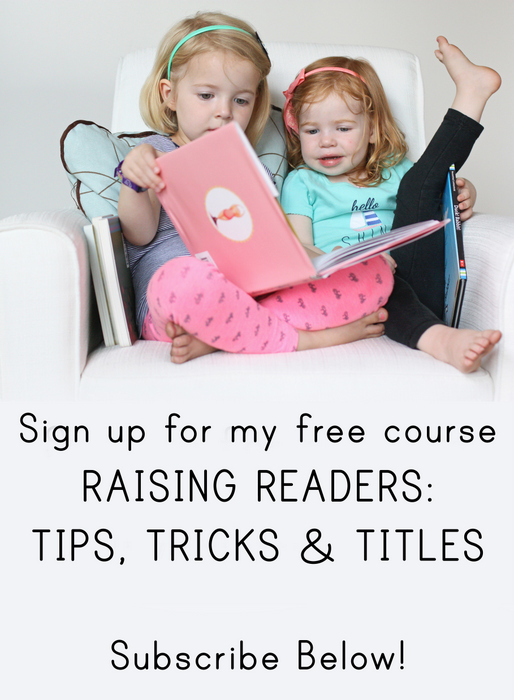 If you’ve been thinking about trying Grove Collaborative, this is your chance (or if you just like free stuff, which. . .you know I do too!). And when they arrive make your spouse use them to clean the counters. Come to think of it, that might actually be my best cleaning tip. So, this is totally unrelated to this post, but I LOVE your chair painting on your wall. Where is it from? You stink with all the awesome stuff you share! Here I am spending money…on good stuff though. Thanks! We used to do the Stuff Blitz as kids, but my dad called it a “Cleaning Frenzy” . ? My 4 year old already isn’t a huge fan of it, but I’ll have to keep trying!